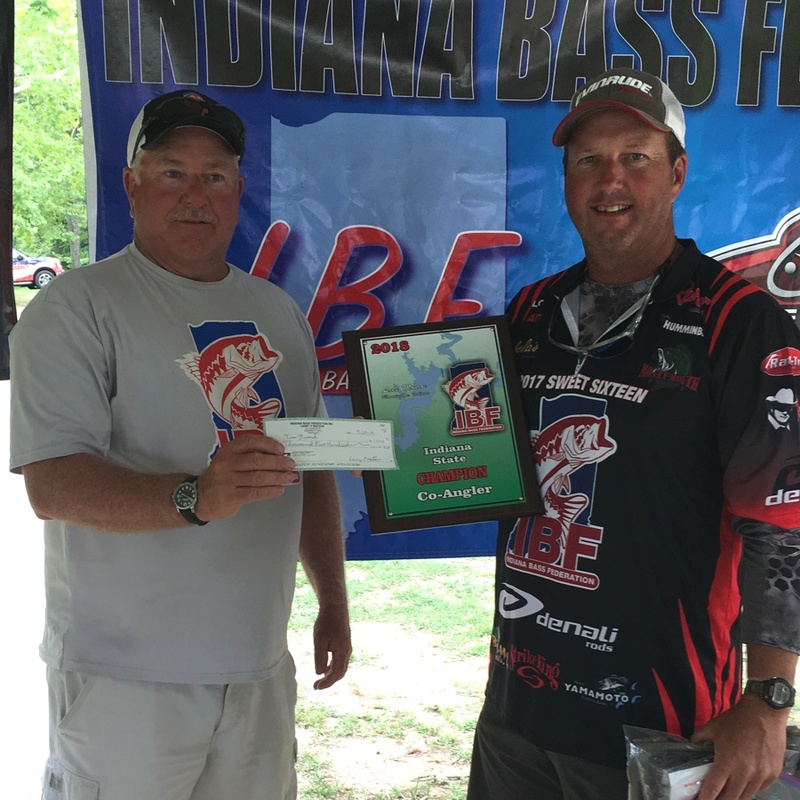 Your Indiana Bass Federation held your 2018 State Finals at Monroe Saturday and Sunday July 28-29. Qualifiers from the each of the four zones and the Invitational Trail fished in the Angler-Co Angler format for bragging rights and to grab a portion of the $15,000.00 purse. Also the top 8 Anglers and 8 Co-Anglers will be given a jersey to wear at the TBF Semi Finals honoring them as Indiana’s “Sweet Sixteen”. 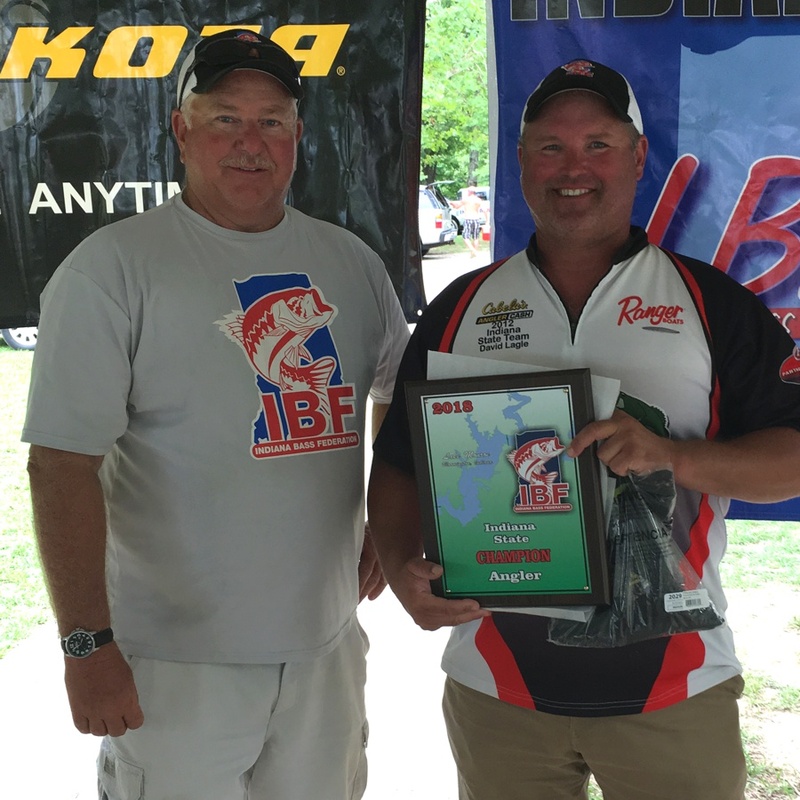 Although there is no more State Team those 8 anglers and co-anglers will be recognized at the TBF Semi Finals when Indiana qualifiers fish against Illinois qualifiers. See the Sweet Sixteen Sponsors. The State Finals Angler Champion was David Lagle of the Tri County Bass Anglers, Zone 4. David of Mitchell Indiana had 5 bass on Saturday weighing 14.57 lbs backed up on Sunday with 3 bass weighing 10.12 that total of 24.69 bested Scott Bateman of the Patoka Valley Bass Masters. Scott had 5 on Saturday for 13.09 which included a 5.11 Big Bass award winner. Sunday Scott added 4 more weighing 11.03 giving Scott 2nd place with 24.12 lbs. Tim Guard of the Zone 2 Morgan Monroe Bass Masters won the Co-Angler side with 5 bass weighing 15.27 lbs. all five came on Sunday. That come from behind sack bested Dennis Davis of the zone 2 Cataract Hawg Stalkers. Dennis led day 1 with 8.06 lbs. which included Saturdays Big Bass of 4.87. Dennis added 2 for 3.51 on Sunday for a 2nd place Co Angler total of 11.57lbs. First Place in each division won $1,500.00 Second place paid $1,100.00. A big bass pot was awarded each day and a side pot awarded cash each day. See the complete results.